We read in the news recently that North Dakota monthly oil production had peaked. I reviewed the situation it to see how significant the peak was. 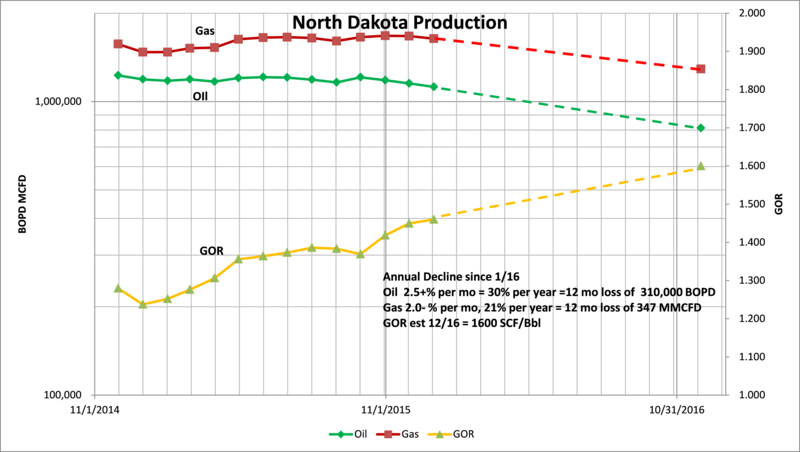 The plot and data below show illustrate that North Dakota daily crude production is on a significant decline (which really began in November), the decline in daily rate for January was 2.65% per month, that translates to nearly 30% per year. Natural gas is similar, a little more than 20% per year. 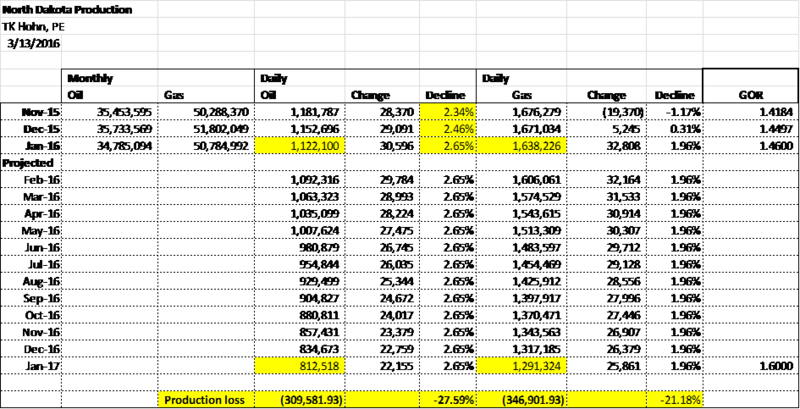 Increasing GOR’s from the Bakken producers coupled with the oil decline shallows the decline for gas. Note that the monthly decline rate is increasing every month. With the lack of drilling to mitigate the steep initial decline rates of new wells, the monthly decline will very likely accelerate, and the annual decline by 01/2017 could be considerably more than the 28% I have shown, (possibly 40% plus). I think this is an accurate picture of what is in store, excess volumes in ND will drop dramatically, transportation and price differentials should come back in line throughout the year. The packed gas lines will start to open up and prices should improve on natural gas as well. Extending this analysis to the US supply, much of which is shale play related, you can draw similar conclusions. If our current domestic production is 9 Million BOPD, a 30% decline equals nearly 3 Million BOPD, which is about 1 Million BOPD more than the global surplus as I understand it. While there are a lot of political issues and such that could still affect oil and gas prices, it appears to me the oversupply is going to rapidly disappear and other market fundamentals will take over.